No doubt about it, Chacala is a beautiful place. The beach, about a half mile long, is set in a natural cove surrounded by mountains. What makes it so exceptional is the thick forest of coco palms framing the beach. It is a good free anchorage for yatch people living the dream. The beach is lined with palapa style tourist restaurants. You will not find many Mexicans here and the food is designed for what the Mexicans think the tourists might like. Unlike the rest of Mexico, there are many rules - no vendors, no dogs, wash your feet etc. The restaurant we went to offered bad service (no salt - no napkins) with mediocre food and high prices. But enough said. Everyone else I have talked too loved Chacala unconditionally. As you walk up the hill and thru the town, Mexico magically reappears and it is quite pleasant with many Mexican and gringo homes and guesthouses. La Caleta is a deserted surfers beach which you can hike to - about 2 hours each way. Or you can hire a boat to get there, probably the best way although not cheap. 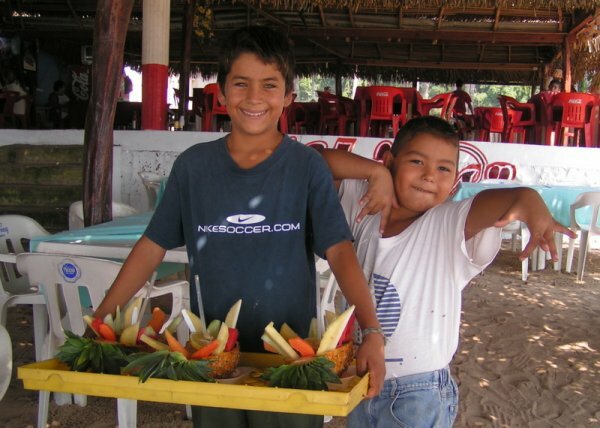 Chacala is located off the coastal route from Puerto Vallarta to San Blas near the town of Las Varas. Look for the small Chacala sign just south of Las Varas. It is about 20 minutes the main road. There is a turtle sanctuary near Zacualpan (about 10 miles north of Las Varas) which is well worth the visit. There is a sign on the road pointing the way. You may have to ask for directions as you go but we were able to find it and it was totally undeveloped and a great spot for birdwatching and relaxing.